I made the short drive downhill through the dark empty streets of Pasadena to the Caltech campus, where I found myself at 4:30 AM, freshly showered, partially awake, and uncharacteristically nicely dressed, unlocking my office building to let in news crews that had been waiting outside. All of the local news affiliates were there, as well as representatives of most of the national networks. Outside, a Japanese-speaking crew was pointing their TV camera up at the sky, their flood lamps disappearing into space. A glance at their TV monitors showed nothing but flood lamps disappearing into space. 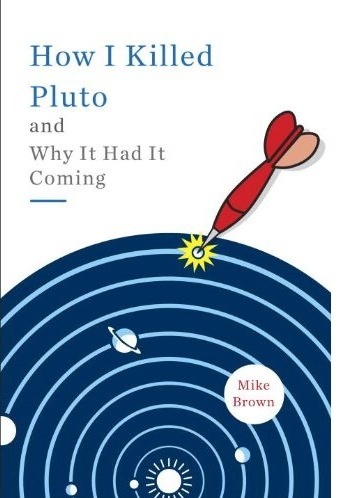 Most people will probably think of tomorrow as the 5 year anniversary of the demotion of former-planet Pluto. That seems fair; the Pluto demotion got all of the news, caused all of the fights, and promoted all of the discussion. But now that tempers have cooled and the world has come to terms with a new more scientific eight-planet solar system, it is time to remember the other important thing that happened on that day five years ago. On August 24th 2006 the International Astronomical Union (IAU) defined a new class of objects in the solar system: the dwarf planets. As you will recall, the IAU declared that planets are the objects which go around the sun and gravitationally dominate their orbits. In our solar system, the eight planets are unique in that behavior. But there are other much smaller bodies out there – Pluto being the most famous – that look like planets (simply meaning that they are round) but are not dominant. Pluto and many of these other objects all circle the sun in similar orbits in what is called the Kuiper belt. 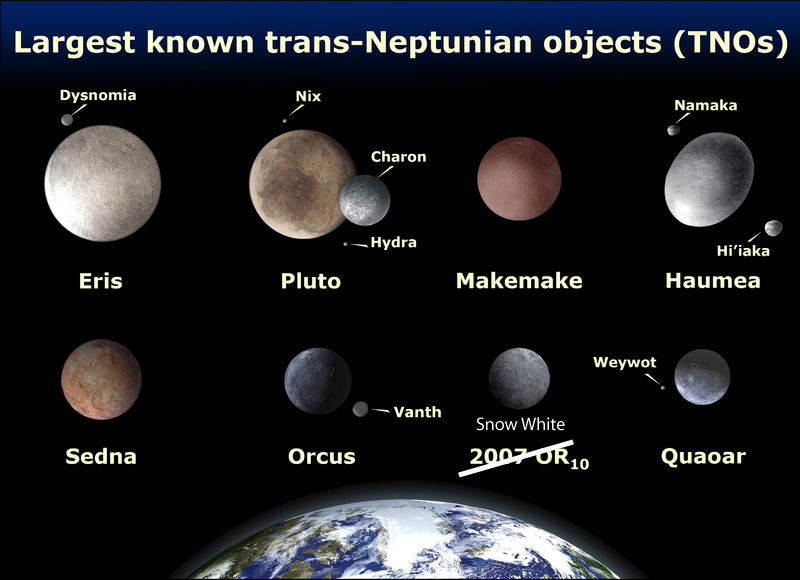 These objects are the dwarf planets. At the time this new class of dwarf planets was proposed, the IAU also declared that three dwarf planets were then known: Ceres (the largest asteroid), Eris (the newly discovered largest Kuiper belt object which precipitated all of this mess), and Pluto. In the entire five years since then, the IAU has declared two other objects to be dwarf planets: Makemake and Haumea. A reasonable person might think that this means that there are five known objects in the solar system which fit the IAU definition of dwarf planet, but this reasonable person would be nowhere close to correct. By my best estimate there are possibly 390 known dwarf planets in the solar system (don’t worry, I’ll explain below). Snow White’s chance for redemption finally came last year. I got an email from Adam Burgasser, an astronomer at UC San Diego, best known for his studies of brown dwarfs in the local universe (less well known, but perhaps more relevant in this case, is that I was his Ph.D. advisor a decade ago). Adam had just moved from MIT where he had helped design a new instrument for the Magellan telescope in Chile – the FIRE spectrograph -- perfectly suited for studying brown dwarfs. An instrument perfectly suited for studying brown dwarf turns out, by coincidence, to also be ideal for studying the surfaces of objects in the Kuiper belt. Adam wanted to take this new instrument on a quick test drive on something interesting in the outer solar system. He emailed me asking if there were any bright objects in the Kuiper belt worth observing. My instant response: YES! One of the nicest things about science is that, usually, when you’re wrong you’re just wrong. There is no use sitting around arguing about it or trying to persuade someone to change his mind, you’re just plain wrong and the universe has explained it to you. Game over. Thanks for playing. Try again later. Next? Only there really was no “next.” Red? For the most part, colors of objects in the Kuiper belt are relatively mysterious, so there wasn’t much of story there. Snow White remained nicknamed Snow White, despite the now obvious inappropriateness of the name, but it mostly became known as a moderately large object in the Kuiper belt that didn’t have a real name. As I mused in this space 2 1/2 years ago, Snow White needed a bailout. By which I meant, we needed to find out something interesting about it or it was never going to be worth talking about, much less naming. As I said back then, "Snow white? Well, it’s just a big Kuiper belt object." And then something really interesting happened: Snow White got brighter. While observing a slew of Kuiper belt objects at the Keck observatory two years ago, we swung the telescope around to Snow White and were shocked to find out that it was almost two times brighter than we had expected. Nearly four years ago, during the Ph.D. thesis research of my former graduate student Meg Schwamb, we discovered a distant bright Kuiper belt object. Our hope had been that something so distant would be like Sedna – far away, but part of an even more distant population. But it wasn’t. The object was more like Eris – far away, but on its way back in. The object got an official license plate number, based on the date of discovery: 2007 OR10. Back then, I was surprised to have found something so bright so far away. It’s true that Eris is even brighter, but partially it is so bright because it is covered in icy frost that reflects almost all of its sunlight. 2007 OR10 didn’t seem big enough to have enough of a gravitational pull to hold onto enough gasses to have a frosty surface. So why should it be so bright?